The purpose of this conference is to examine the difficulties and possibilities, and theoretical problems and hands-on solutions arising in the description of religious experience. Does religious experience harbor concealed empirical and phenomenological complexity, and how do we address complexity in a focused description which aims at revealing the essence of experience? We invite an interplay between pragmatics of describing religious experience, philosophical and theological issues involved in creation of description, and theoretical models of how religious and spiritual experience may be described. The conference accepts papers dedicated to description of perception, imagination, body-awareness, recollection, social cognition, self-experience, temporality etc. in the context of religious experience. How does phenomenological description of religious experience translate into ecology, history, or natural science, and how does it manifest in different cultural contexts? The papers should provide not just the description of experience per se, but an analysis of the process or outcome of description and reflection on what description of religious experience per seentails. Such reflections must employ phenomenological philosophy, such as e.g. in the work of Anthony Steinbock of Jean-Luc Marion, but can also draw on contemporary dialogues between phenomenological philosophy and other philosophical and theological traditions, such as we see in the work of researchers like Espen Dahl, Matthew Ratcliffe, Dan Zahavi, Stanley Cavell, or Evan Thompson, to name a few. Please submit your abstract of approximately 300 words to conferencevalpo@sophere.org . You can also enclose a paper of 3000 words ( i.e. 20 min reading time and 10 min questions). Submissions with ready papers will be given a priority. Session proposals with at least three presentations are also welcome, and must include the abstracts, a clear title of the session, a name of its chair, and a short description of the session. Abstracts have to be written in English. Submission should include a .doc file with your name, paper title, affiliation, up to five key words, and full contact information, and a .pdf file formatted for anonymous review. Submission deadline is July 1, 2019. Notifications of acceptance will be issued by August 1, 2019. Examples of questions we’d like to answer are listed below. How does description of religious experience relate to ecology, environmental studies, health sciences, natural sciences, history, business studies, etc. ? 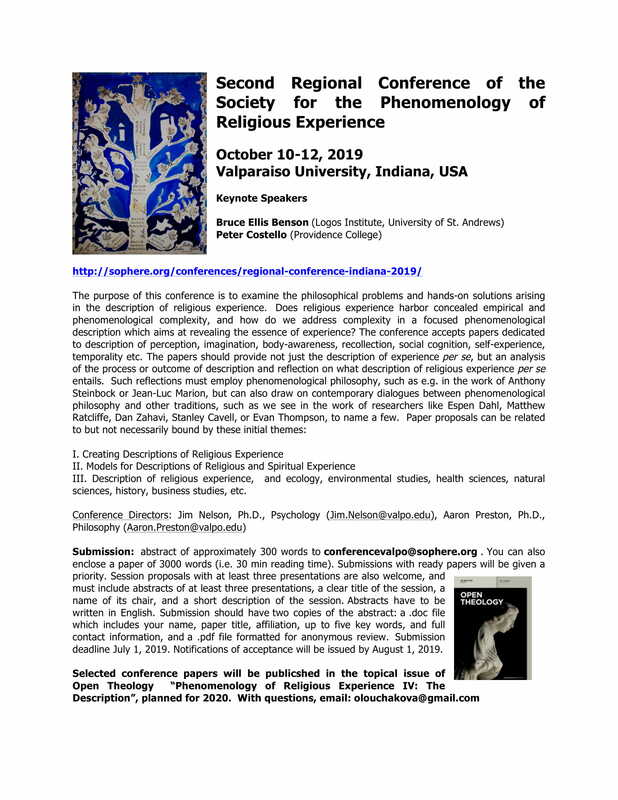 As an established tradition, selected papers from the conference will be invited for publication in the topical issue of Open Theology, De Gruyter, “Phenomenology of Religious Experience IV: Description”, planned for 2020.